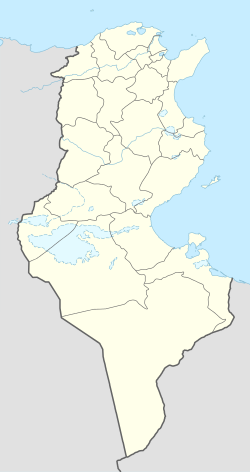 Manouba (Arabic: منوبة‎ manūbā) is a city in north-eastern Tunisia, part the agglomeration of Tunis, also called "Grand Tunis". It is located at the west of Tunis city center at around 36°48′28″N 10°6′4″E﻿ / ﻿36.80778°N 10.10111°E﻿ / 36.80778; 10.10111. It is the capital city of Manouba Governorate. Manouba is well known for its university. It is also an ideal place for family life because of its security, availability of all kinds of services and its high level of education. Historically, Manouba is noted as the birthplace of the sufi saint Sayyida ʿĀʾisha al-Mannūbiyya (1199–1267 CE), and until 2012 the city contained a shrine to her, supposedly her father's house. It was customary in the nineteenth and early twentieth centuries, for the Beys of Tunis to make a ritual circuit of city's the great shrines on the 27th day of Ramaḍān (laylat al-Qadr) and visit this shrine. More recently, 'up until the Tunisian revolution of January 2011, once a week, on Sundays or Mondays, rituals were held ... During the day, the shrines were women’s space, devoted to music and trance rituals. At night, they became men’s space, dedicated to Ṣūfī ceremonies (dhikr ...)'. However, on 6 October 2012, the shrine was burned down by religious extremists, thought to be young Salafis; ʿĀʾisha's catafalque was entirely destroyed. Manouba Palais la rose 6. Early C20 picture of Mannouba railway station. Entrance to the Musée de mannouba. ^ Katia Boissevain, 'al-Mannūbiyya, Sayyida ʿĀʾisha', in Encyclopaedia of Islam, THREE, ed. by Kate Fleet, Gudrun Krämer, Denis Matringe, John Nawas, and Everett Rowson (Leiden: Brill, 2013-), https://dx.doi.org/10.1163/1573-3912_ei3_COM_24813. This page was last edited on 15 December 2017, at 02:44 (UTC).